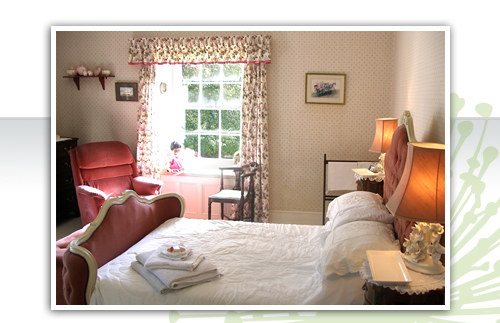 We have three double rooms, two which overlook the garden and one small single room. One of the double rooms has ensuite facilities with a walk-in shower. The other rooms are not ensuite but it is most likely that you would have the main bathroom for your own private use. This has a bath with shower over and has recently been refurbished. When you see the house you will see why we have been reluctant to adapt the other bedrooms to ensuite – it is a traditional farmhouse from the William IV era and such conversions would in our view spoil the architecture. There are no tea and coffee facilities in the rooms – we prefer to deliver freshly brewed tea and or coffee at anytime. All the usual equipment is available TV, hair dryer, ironing etc and wet clothes can be dried overnight on the Aga. Fresh flowers will be found in your room.